This happened one hot summer, July day. A new title was a Must. “Something that sounds bestselling,” of course. In two days. Bingo! One of my most favorite of all titles, and the book that finally made onto the USA Today best seller list. If you’d like to read my story of becoming a true tea-lover, if you are a devotee to good tea, pop over to The English Tea Blog, to read my post Confessions of a Tea-Drinking Southern Belle. CurtissAnn, who just finished a cup of Ceylon tea, laced gently with a bit of lemon and agava syrup. Oh, hi, CurtissAnn. It’s so lovely hearing the behind the scenes stories of books I’ve read and enjoyed! It also scares me to death and I simply am not made of the stuff that would allow some “editor from on high” to decide the name of my book is wrong. LOL! Being from a family where the coffee pot was always full, I didn’t learn to appreciate hot tea until my daughter was grown and developed a taste for hot tea. How she escaped being a coffee drinker, I’ll never know. Now my cabinet is full of just about any kind of tea desired. As a matter of fact, I had chai last night. Curtis Ann, It’s been such a long time since I’ve visited you….or you ME! 🙂 I did not realize you had actually moved. I hope you’re loving your new location. This book you featured sounds so intriguing….it MUST be that splendid title you selected. CurtissAnn, I miss you. “Cold Tea on a Hot Day” was one of my favorites. I remember all the cute tea note cards you would send. Those were great. A little packet of tea with your words of great wisdom. I have a couple of favorites on flavors. My long time favorite is Peppermint, and that is the one I run to, especially when I am feeling down. Then my two other ‘favorites’ are Bengal Spice by Celestial Seasonings and Vanilla Chai by Bigelow. Awesome. Blessings to you and Bigstreetrod! I love both hot and cold nowadays. 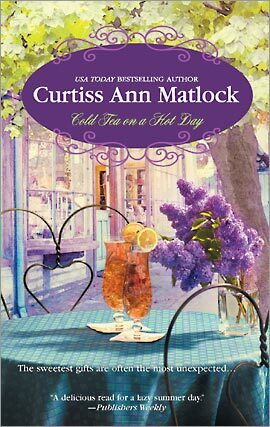 I get thirsty for tea every time I pick up one of your novels and start catching up with my friends in Valentine. They drink a lot of cold tea in that town! We drink iced tea the year round here in Missouri and also hot tea. I even bought a tea pot when we were in England I got so carried away with tea, it looks nice in the china cabinet! We drink a lot of Nestea for iced tea and the bags of different flavors for hot tea. You are all so kind to mention my books. The next installment of the Valentine tales will be published in June of this year. Funny, but I see a progression through my books, with more mentions of hot tea in ‘Chin Up, Honey’. Maybe it depends on the season in which I’m writing.